Today is November 10, 2010. It was on this day five hundred twenty-seven years ago that Martin Luther was born(1483). Martin Luther was one of the first great reformers. He saw ways in which the Catholic Church’s(which claimed to be God’s true church) policies and procedures contradicted the Word of God in the scriptures. And he did something about it. Born in what then was the Roman Empire Martin Luther’s father had great aspirations for his son. His father sent Martin to schools where his son would be trained to become a lawyer. After dropping out of school at about the age of twenty-two Martin Luther decided to pursue philosophy and theology. One day while riding a horse in a thunderstorm a bolt of lightning struck near him. It was this day he dedicated himself to serving God. He joined a friary as a monk on July 17, 1505. Around a 1516 another monk came to Germany at the Pope’s behest, to sell indulgences. As far as I understand an indulgence is money paid to free a person from the punishment of a sin. This monk, Johann Teztel, coined(no pun intended) the phrase, “As soon as the coin in the coffer rings, the soul from purgatory springs.” These indulgences were being sold to help pay for the re construction of the St. Peter’s Basilica in Rome. Martin Luther found this strange that the poor would be asked to pay for this when the Pope was so rich. He asked, “Why does the pope, whose wealth today is greater than the wealth of the richest Crassus, build the basilica of St. Peter with the money of poor believers rather than with his own money?” He also found it strange that money could be used to gain forgiveness for one’s sins. In 1517 Martin wrote his objections about the Catholic church and posted them on the door of the All Saints’ Church. These were known as the 95 Theses. The upset Archbishop Albrecht of Mainz and Magdeburg who needed money from the indulgences to pay for a bishop. But the Pope was also getting half of the indulgences to pay for the Basilica. And if you ever want to get someone riled up, go after their money. 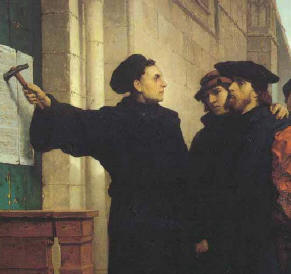 The 95 Theses were brought to the Pope’s attention and he sent envoys to Martin Luther to correct his views. Later in 1519 Martin Luther was invited to a public debate about his beliefs. It was in this debate that Martin Luther dared to speak against the belief that the Pope and church councils could not lead the people astray. The rest of Martin Luther’s life was filled with persecution and hardship as he worked to establish a religion based on his understanding of the scriptures. He also translated the Bible from Latin to German. The language of the common people was German and now thanks to Martin Luther the average person could read and understand the word of God. No longer did hey have to rely on leaders for their understanding of scripture. It was also thanks to his German Bible that the King James Version was translated. I strongly suggest you research more about the fascinating story of this man. Surely the spirit of the Lord was with Martin Luther as he fought to return the church to is scriptural basis. We should all take a lesson from him and seek to ensure our church remains firm in it’s scriptural foundations. We may not have Popes and Councils in our church, but we do have Presidents and Committees. Let us not make the same mistakes as our ancestors by allowing such people to do and teach whatever they will, without ensuring that it is in line with the Gospel of Jesus Christ. I would like to include some quotes of Martin Luther I find inspiring. In Romans 7, St. Paul says, “The law is spiritual.” What does that mean? If the law were physical, then it could be satisfied by works, but since it is spiritual, no one can satisfy it unless everything he does springs from the depths of the heart. But no one can give such a heart except the Spirit of God, who makes the person be like the law, so that he actually conceives a heartfelt longing for the law and henceforward does everything, not through fear or coercion, but from a free heart. It is for Christ’s sake that we believe in the Scriptures, but it is not for the Scriptures’ sake that we believe in Christ. All who call on God in true faith, earnestly from the heart, will certainly be heard, and will receive what they have asked and desired, although not in the hour or in the measure, or the very thing which they ask; yet they will obtain something greater and more glorious than they had dared to ask. We cannot attain to the understanding of Scripture either by study or by the intellect. Your first duty is to begin by prayer. Entreat the Lord to grant you, of His great mercy, the true understanding of His Word. There is no other interpreter of the Word of God than the Author of this Word, as He Himself has said, “They shall be all taught of God” (John 6:45). Hope for nothing from your own labors, from your own understanding: trust solely in God, and in the influence of His Spirit. Believe this on the word of a man who has experience. This link was given to me by a friend and I post it to honor Martin Luther, the other reformers of History, Joseph Smith, and all other great people in history and today, who stand up against unrighteous dominion to do what they know is right. Great tribute. The link regarding the Church Handbook is incredible. It seems the trend all along is to have somebody else “do the thinking” so you never have to figure anything out on your own. Truly dangerous! Found the password below, link worked, very helpful and thank you! does anyone still have a copy of that church handbook I can never seem to find one??? I have one somewhere. I’ll see if I can find it.